I have not mentioned vibrato so far in this tutorial as I believe it is quite important that each player develops his/her own style of vibrato. Hopefully having got this far into the tutorial you will have already tried to do just that. I think the video gives a good illustration of how important vibrato is to slide playing - the tune sounds much more realistic ( like someone singing ) when the vibrato is applied. Just move your arm up and down the neck fairly rapidly and you have vibrato - use your ears to try and keep in tune - once you have mastered a vibrato technique you can use it to fine tune notes as you play them ( by creeping up or down a bit as you vibrato ). By " blurring " in terms of absolute pitch the note that you're playing vibrato tends to make it sound more in tune than the same note without vibrato. Wide Vibrato - go quite a long way either side of the actual note. Narrow Vibrato - go a very short distance either side of the actual note. Quick Vibrato - as the name implies. Slow Vibrato - as the name implies. Start slow then go quick. Start with no vibrato then add it. 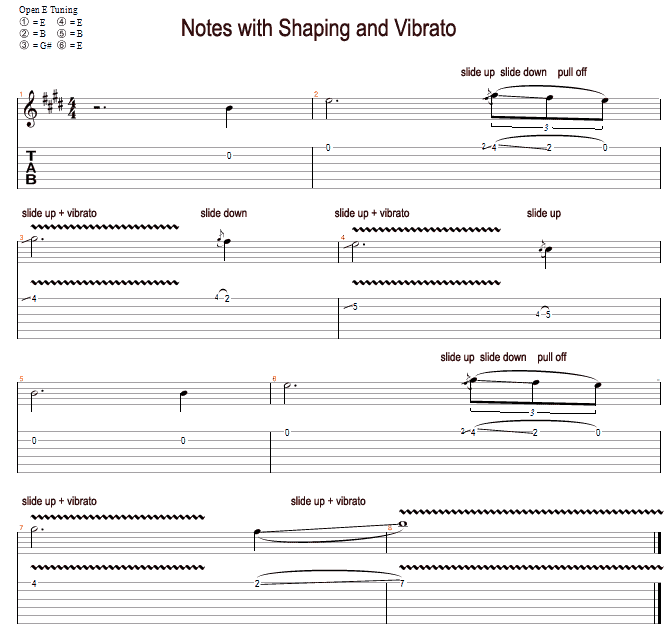 Sharp Vibrato - vibrato slightly higher than the actual note - this can add " edge " in certain styles. 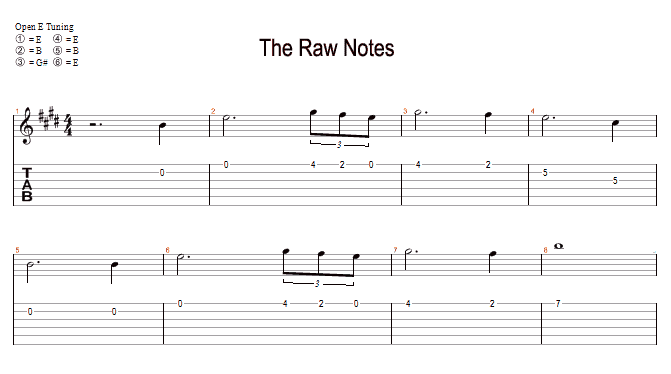 The raw notes part of the video sounds particularly bad because the strings are pretty old - but the vibrato makes them sound fine. Shaping notes is similar to what a good singer will do - sliding into notes rather than going directly to them. I have given a detailed description of the way I shape each note of the piece in the second tab/score. Obviously where the note is an open string no shaping is possible. I am in open E tuning for this one.